Duane would like to thank all the loyal fans, racers, crew members, officials and sponsors for their support of the Shields family. The website is updated finally! Unfortunately, we had to do a complete upgrade on the software and had to buy a new computer to accommodate the updates so we got way behind. But we are back...finally! We are sorry for the long delay on getting the site updated! You can be sure that the site will be updated no more than a day after each event! Gainesville FL - Duane Shields, a three time Gatornationals Champion, looked like he was bound for another trip to the Winner's Circle at the 50th Annual Amalie NHRA Gatornationals. But out of the blue, his A/Fuel Dragster uncharacteristically lost traction in the semifinal round. "I'm taking this loss a bit harder than most. We wanted to win the 50th annual race more than any other event in the past two years but it wasn't meant to be" Duane said following the conclusion of the race. 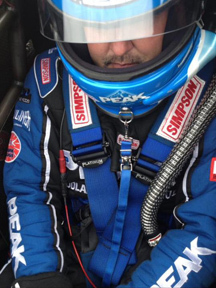 Duane qualified in the top half of the field with an impressive 5.20 at 275 MPH to land in the number 4 spot. In Saturday's opening round, Duane faced Jered Dreher. Duane had no trouble defeating Dreher by two tenths of a second as he scored a fine 5.23 at 274 MPH over Dreher's 5.46 at 260 MPH. In the quarterfinals, Duane was matched up with Tom Fox. This would be a much closer race than the opening round as both cars left the starting line close to the same time with Duane getting a slight edge with an .081 to Fox's .089. 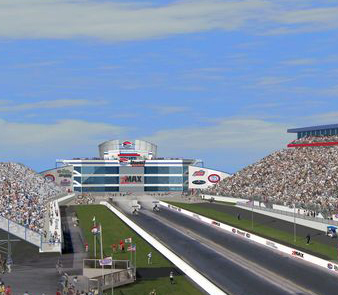 The PEAK Dragster never trailed and beat Fox by less than a car length with a 5.27 at 275 MPH to Fox's valiant 5.30 at 271 MPH to advance to the final four. The PEAK Team had to wait until Sunday for their semifinal match up against Mike Bucher who had qualified on the bump and thus far was having a hey day in eliminations. As the lights came down, Duane lost traction just as he hit the throttle and was forced to abandon the run. Meanwhile, Bucher was on a trouble free run and took the win with a 5.36. Duane was not happy with the results. "There was no reason for our car to have smoked the tires. We had the same set up in it from Saturday when we ran consistently in the 5.20's. We had a conservative tune up and the conditions were nearly the same. We felt really good going into Sunday believing we could win this race. It was just a different day" Duane said. 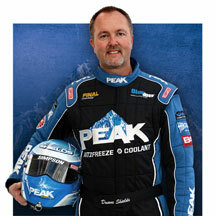 The PEAK team will be off for several weeks before returning to action at the Four Wide NHRA Nationals, April 26-28. "With the next race being a month a way we will have time to analyze and evaluate why it lost traction" Duane said. 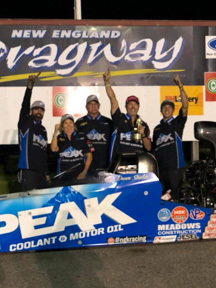 Duane would like to thank PEAK Antifreeze and Motor Oil, Final Charge, Blue Def, NGK Spark Plugs, GRP Connecting Rods, Brad Anderson Enterprises, Hot Wheels Car Care Products, SRI and Clean Boost for their incredible support. 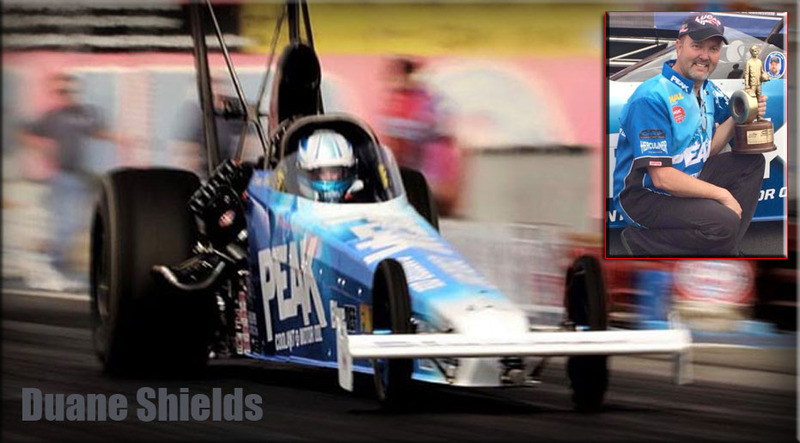 Gainesville FL - Duane Shields had a decent day at the "Baby Gators", the NHRA Lucas Oil Drag Racing Series event held prior to next week's Amalie Oil NHRA Gatornationals. Surprisingly, this was likely a harder race to qualify for then next weekend's national event because this weekend 16 cars fought to get into an eight car field so half the field did not qualify! 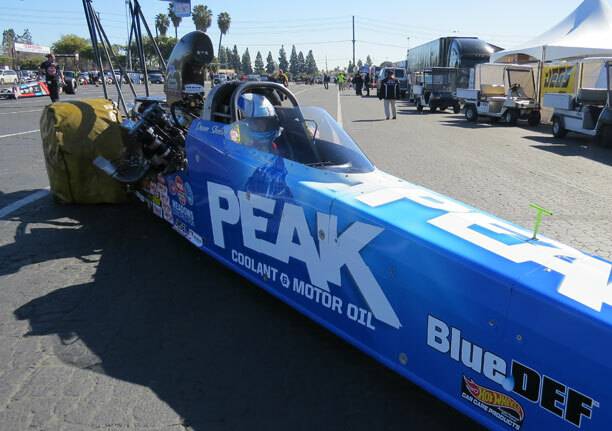 The PEAK A/Fuel Dragster was one of the cars that did and squeaked into the field with a 5.41 at 274 MPH. In round one, Duane faced the top qualifier Jackie Fricke who easily slid into the field with a strong 5.29 at 277 MPH. As the lights came down the christmas tree, it was Duane off of the line first with an .064 light to Fricke's .076. Duane's lead continued all the way to the finish line as he upset the number one qualifier with a smooth 5.41 at 274 MPH over Fricke's 5.58 at 271 MPH. Next up for the PEAK Team was a semi-final round match up against Josh Hart. At the hit it was Duane out of the gate first with a .054 to Hart's .063 but soon after Duane begin to suffer traction problems on the tricky track and wisely clicked off the engine. Meanwhile, Hart was on a clean pass and cruised to the win with a 5.36 at 272 MPH. 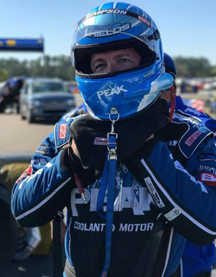 This week the PEAK Team will stay in Gainesville to prepare for the Gatornationals which is the east coast opening of the NHRA national drag racing season. 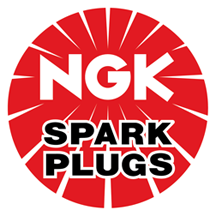 Duane would like to thank PEAK Antifreeze and Motor Oil, Final Charge, Blue Def, NGK Spark Plugs, GRP Connecting Rods, Brad Anderson Enterprises, Hot Wheels Car Care Products, SRI and Clean Boost for their support. The PEAK Dragster is ready for round two of qualifying. Duane takes the early lead early over James Stevens. Sadly, Stevens went into the safety net at the end of the track when his chutes failed to deploy. 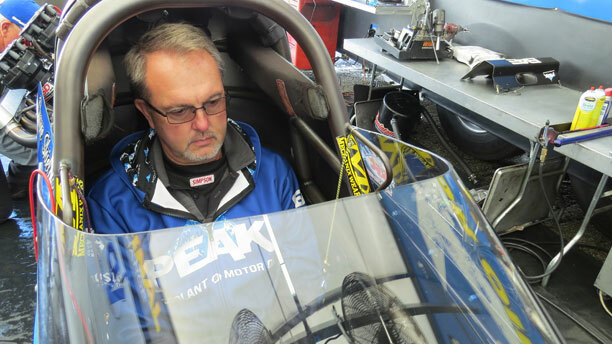 On Monday, eliminations continued and the PEAK Team was ready to take on their next competitor, Shawn Cowie. As the cars left the starting line it was Duane out of the box first with a .072 to Cowie’s .099. Unfortunately for Duane, Cowie was on the quickest run in history for a blown alcohol dragster and Cowie stopped the clock with a 5.16 at 280 MPH to top Duane’s very respectable 5.27 at 277 MPH. “Because of the conditions, we backed it down a little bit to be sure we could get off the starting line without losing traction. We made a good pass but Cowie ran the quickest run in history so there wasn't much we could do to stop him” Duane explained. Duane gets focused before the second round of eliminations against Shawn Cowie.